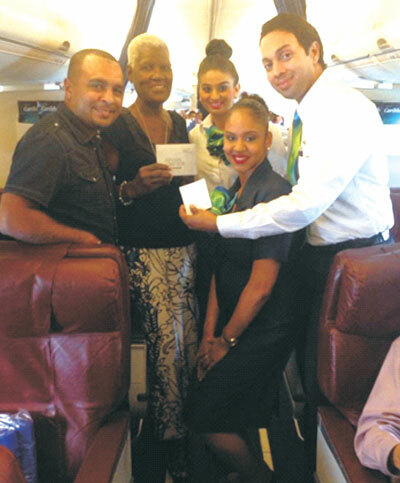 As Caribbean Airlines celebrated the 12 days of Christmas, 23 lucky passengers were surprised with the gift of travel. From December 22 to December 25, 2014 and from January 1 to January 3, 2015, one passenger on each of 25 randomly selected flights will receive a ticket to a Caribbean Airlines destination of his/her choice. On January 4, the surprise will be supersized with three passengers being gifted with four tickets each to any Caribbean Airlines destination. Each prize-winner will receive delicious Trini fruit cakes, courtesy of Kiss Baking Company, who partnered with Caribbean Airlines to showcase the true spirit of Christmas. Passengers flying on Caribbean Airlines will also experience holiday cheer as the airline serves its signature cocktail, Caribbean Spice, featuring El Dorado Rums and Nestle Orchard fruit juices. “We were inspired by the idea of connecting family and friends during this season of giving, which is at the heart of what we do”, said Alicia Cabrera, Senior Marketing Manager, Caribbean Airlines. “The gift of travel is our way of giving back to our customers who have supported us throughout 2014. It is our hope to create unforgettable moments during these 12 days of Christmas,” the Marketing Manager said.